The fight over oil and gas drilling in the US has been rekindled on a new front - or rather multiple fronts in coastal waters ranging from Virginia to Florida and from California to Alaska, according to an article in the Christian Science Monitor. With war in the Persian Gulf, the effects of hurricanes Katrina and Rita last summer, and historically high prices at the gas pump [with more of the same on the way, see the recent post on Summer 2006 gas price forecasts], the Bush administration sees offshore oil and gas drilling as a key element in its push toward energy independence. 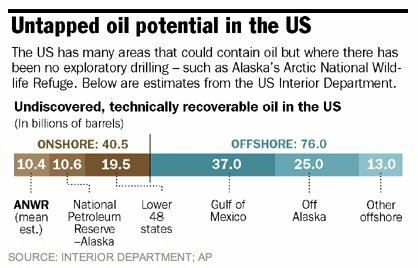 But, as with the debate over the Arctic National Wildlife Refuge, many are skeptical and see the prospect of renewed offshore gas exploration as a potential pollution danger that would take years to produce what likely will be relatively insignificant amounts of oil and gas. According to the Monitor, officials in coastal states have mixed views on the subject, including whether to lift the present moratorium on offshore drilling along much of the US coast, which has been in place since 1981. "With an eye toward potential royalties as well as environmental impact, many coastal state lawmakers and governors want to increase their control of such development," the Monitor writes. The US Interior Department's Minerals Management Service (MMS) has proposed leasing areas offshore Virginia, the Gulf of Mexico, and Alaska for energy development. Oil and gas developers are happy with the proposal - as far as it goes. "It's a step in the right direction," says Mike Linn, chairman of the Independent Petroleum Association of America. "However, the majority of the Outer Continental Shelf (OCS) remains off- limits," he says, noting that some 90 percent of US waters have drilling bans - an area whose potential resources could replace Persian Gulf oil imports for several decades. In its recent five-year leasing proposal, MMS estimates undiscovered resources to include 85.9 billion barrels of oil and 419.9 trillion cubic feet of natural gas technically recoverable from all federal offshore areas. "It's a substantial amount," says Amy Myers Jaffe, associate director of the Rice University Energy Program in Houston. "It's many, many years of supply for current demands." An important driver for offshore drilling - especially for natural gas - is recent price trends. The average wellhead price per thousand cubic feet has risen from $2.19 in 1999 to $9.00 in 2005, according to the US Energy Information Administration. "High, volatile natural gas prices will moderate only when supply and demand are brought more into balance," says Tom Moskitis of the American Gas Association. Citing last year's hurricanes as evidence of the industry's ability to withstand major hurricanes with no significant pollution from producing facilities, MMS Director Johnnie Burton said in releasing his agency's lease proposal, "The offshore energy industry has compiled an outstanding safety record that allows development of these resources without significant risk to the environment." Ever since President Bush took office looking to expand domestic energy production, his brother Florida Gov. Jeb Bush (R) has opposed efforts to allow offshore drilling near his state. As environmentalists see it, the prospect of expanded offshore energy drilling puts at risk places such as Santa Monica Bay in California, Acadia National Park in Maine, and the Outer Banks in North Carolina. Commenting last week on the MMS five-year plan for OCS oil and gas leasing, a coalition of 27 environmental organizations warned: "Exploration and development of gas resources produces routine discharges of spent drilling muds, contaminated produced waters, and highly-toxic metals and hydrocarbon compounds into the marine environment, in addition to creating a demand for onshore gas processing facilities in sensitive portions of the coastal zone." In Congress, a raft of bills dealing with offshore oil and gas has been introduced. Senate Energy Committee chairman Pete Domenici (R) and his fellow New Mexico senator and senior committee Democrat Jeff Bingaman are pushing legislation which would open some 3 million acres off the Gulf coast of Florida to gas exploration - half again as much as the 2 million acres the Interior Department proposes. Hoping to mollify Floridians, Sens. Domenici and Bingaman would keep a 100-mile buffer between energy exploration and Florida beaches. That's not enough for Florida Sens. Mel Martinez (R) and Bill Nelson (D), who want to scale back the size of the lease considerably while pushing the buffer out as far as 260 miles. Sens. John Warner (R) of Virginia and Mark Pryor (D) of Arkansas propose letting coastal states opt out of longstanding federal bans on gas exploration and development, as does Richard Pombo (R) of California, chairman of the House Resources Committee. Rep. John Peterson (R) of Pennsylvania would lift all current bans on offshore gas production. Drilling opponents in Congress are organizing as well. Led by Rep. Lois Capps (D) of California, 115 House members recently called for a continued moratorium on new offshore oil and gas drilling in sensitive coastal waters. In Virginia last week, Gov. Tim Kaine (D) rejected a state legislative plan that would open his state to offshore drilling. Environmentalists view Governor Kaine's move as a hopeful sign about what they fear could be a series of states falling to energy development. "We see Governor Kaine's action as a victory, definitely a momentum builder," says Annie Strickler, spokesperson for the Sierra Club in Washington.